Art in Practice: Toronto Arts Council - More Money on the Pile or Down the Pit? Toronto Arts Council - More Money on the Pile or Down the Pit? 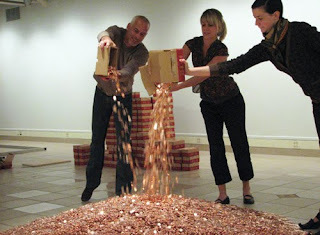 Image: Installation of Gerald Ferguson's piece, "1,000,000 Canadian Pennies" (1979, Collection of the Art Gallery of Nova Scotia ) at the University of Saskatchewan in the Fall 2007 [http://www.usask.ca/communications/ocn/07-sept-21/index.php]. I recently met with William Huffman, Associate Director; Visual & Media Arts Officer; and Literary Officer at the Toronto Arts Council, to learn more about the council, about how it operates in the larger scheme of the Toronto arts community. Of course, this is also under the auspice of my own career, learning more about who is involved, how they operate as arts advocates, and what kind of programmes they support through grants to support the arts community. The Toronto Arts Council has its hands in many organizations, and those many organizations have their hands in the TAC's pot in return. You may have seen the TAC listed in the roster of sponsors for almost every exhibition or event attended in Toronto. The organization is broken into different sections: the governing board (which includes city counselors), the different discipline councils (theatre, dance, visual and media arts, literary, music, community arts) which make decisions on which groups and organizations are awarded grants, and the several juries which are responsible for determining individual artists' grants. The TAC was developed out of the Toronto City Council and, although autonomous, still relies on the support of the City for year to year operations. There remains an internal cultural support body within City Council that is responsible for the huge-big-budget-big stars events like Nuit Blanche and the Toronto International Film Festival. The operational model at TAC is similar to the model that many artist-run centres continue to practice, since those sitting on the discipline councils have had prior careers within those disciplines, either practicing artists, musicians/composers, theatre directors etc. Historically, ARCs have been developed and operated by people who are also practicing artists. This is still the situation in certain institutions, but in many cases the directors/curators in ARCs now have backgrounds in business, administration or academic degrees in art history or curatorial and museum studies. These adaptations formed naturally since many artist-initiated organizations just don't last very long (and sometimes aren't intended to)--the space is lost, the funding is drained, there are creative conflicts of interest etc.-- only because artists aren't necessarily trained in business management. From my meeting with Mr. Huffman, it was confirmed (not at all unexpectedly) that the survival of the arts community is still shaky and more uncertain than you would hope. Organizations like TAC have annual meetings with City Council to defend their importance within the Toronto arts community under threats of closure. The situation sits as a microcosm of the Harper/Conservative government's relationship with the national arts community, with the belief that "ordinary Canadians" don't care about the arts, with recent dismal cuts: the canceling of the PromArt programme; the official axing of the National Portrait Gallery; significant cuts to arts funding in British Colombia (http://www.straight.com/article-257341/artscuts-casualties-piling); and the dissolve of the Canadian Museum of Contemporary Photography (and the list goes on). With continued confidence and strong, active advocacy, the arts community can expect to stay afloat, as it always has, adapting to cuts and creating new organizations and opportunities. There may be a new way to reverse the opinion, cited by Huffman, among governmental officials who consider funding for the the arts "like throwing money into a bottomless pit." ouch.